Robert Louis Stevenson’s writing career spanned only twenty years (1873–94) yet in that time he produced an amazing number and in particular an amazing variety of works—for him each work was a new start, he was continually experimenting. He started publishing in the 1870s as a brilliant and very personal London-based essayist. Then in August 1879 he undertook his punishing journey to California to join his future wife. A year later he returned to Europe and picked up his essay-writing career together with short-story writing. One turning point came with the writing of Treasure Island in the second half of 1881 and then in January 1886 came his ‘break-through book’, Dr Jekyll and Mr Hyde and, later in the same amazing year, Kidnapped. His departure for the USA in August 1887 marks a final turning point as he abandoned London literary life and, as a writer, moved close to literary Realism, adopting a new setting and new themes for the works he wrote in the South Seas (1888–94). Naturally enough, there are few manuscripts extant from his early career: young writers tend to throw such things into the fire and so unfortunately we will never see the manuscript of Treasure Island. 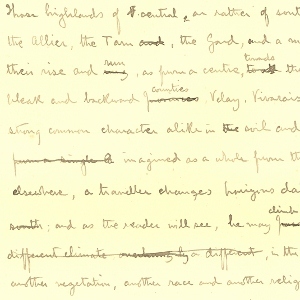 Stevenson’s constant travels, created many breaking-up-home situations where odd piles of manuscript could be thrown away, lost or put down and only in part picked up again: the last three chapters of the Kidnapped manuscript probably got lost in this way and the middle fifty per cent of the Jekyll and Hyde manuscript must have disappeared, after a loose shuffle, in a similar way. After his death, his widow and stepdaughter gave away odd pages of manuscript as keepsakes and Christmas presents. Stevenson’s widow inherited his manuscripts and library and when she died in 1914, her heirs decided to sell off almost everything: this led to the three auctions at the Anderson Galleries in New York in November 1914, continuing in January 1915 and February 1916. The catalogues of these sales are essential reference for Stevenson collectors as they list and describe the vast majority of extant Stevenson manuscripts. These then reappeared in later sales and now most of them have ended up in libraries open to scholars, the lion’s share being at Yale University, most of these the donation of Edwin J. Beinecke. However, a tantalising number of manuscripts surfaced at sales but have never appeared again. Some of these may even be in public libraries as yet unnoticed. Though this is less likely in the computer age of Google searches, it could still happen that a library has manuscripts that have not yet been signalled to Stevenson scholars. Syracuse University Library had a small collection of Stevenson manuscripts from 1970 (including the essay ‘My First Book: Treasure Island’) but this was unremarked by Stevenson scholars until over thirty years later. Other manuscripts are undoubtedly still in private hands, most probably in the USA. Two of them, however, were ‘last seen’ in Britain: the essays ‘Virginibus Puerisque’ and ‘On Falling in Love’, outstanding works of Stevenson’s early career, were sold at a British Red Cross fund-raising sale in 1918 but have been unheard of since. At least these were published, so we can read the final versions, but other manuscripts, even more tantalising, are known to us only by the title. One of these is the autobiographical ‘Memoirs of Himself’, which Stevenson wrote when living alone in San Francisco in 1880: Book I about his childhood is at Harvard, Book II about his youth and University days has disappeared, but Book III entitled ‘From Jest to Earnest’ about his early career and marriage should still exist somewhere: it was sold at the Anderson sale in 1914 but has never been heard of since. Other interesting works that have disappeared from view are his article for boys ‘On the Value of Books and Reading’, sold in 1914; and the journal he wrote as a law clerk in Edinburgh, sold in 1924. The New Edinburgh Edition of the Collected Works of Robert Louis Stevenson would be very interested to learn of the whereabouts of any ‘lost manuscripts’ by RLS, either in overlooked collections in small public libraries or still in private collections.